Canopy Growth, through its subsidiaries, grows and distributes medical marijuana in Canada, while having operations in other six countries. The company provides different types of products such as dried, oils or capsules. The company has been showing very good financials – both revenue and sales of medical marijuana have been growing from quarter to quarter. The number of registered patients has also been growing and this trend keeps going. 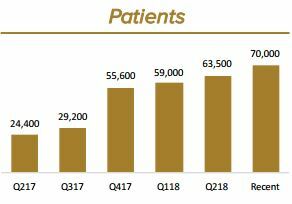 More patients – more profits! These are figures only from medical marijuana operation. After the legalization of recreational marijuana, the numbers on the financial statement will jump significantly – no doubt about that. The stock price of Canopy Growth has quadrupled during 2017 hitting almost 45.0 at the beginning of 2018. 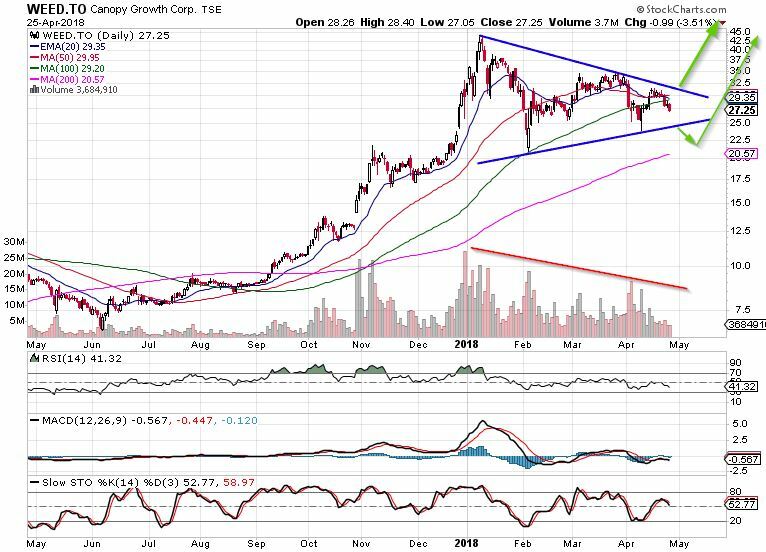 Then, as an entire industry, the stock started its consolidation and currently formed a symmetrical triangle pattern. As depicted below, the stock price is slowly running out of the territory and upcoming earnings results it will very likely break through the upper trend line and then just FLY. On the other hand, the negative news of postponing legalization may push the price down through the lower trend line. This could result in the stock finding its support at 200 SMA. However, the legalization will happen sooner or later, so this would be also a great entry point. Thus, this is time to watch the stock and take an action once the appropriate signal is triggered. Canopy Growth Corporation offers a fabulous opportunity for both long-term and medium-term investors. Important is to stay disciplined and focused on the big picture! Are Pot Stocks Still In Consolidation?